The Society is very sorry to inform you that a long time PAS: APAL member, Dr. John B. Rehder, a cultural geographer at the University of Tennessee – Knoxville, passed away last night, Tuesday, April 19, 2011. He was reportedly in good spirits during a department faculty meeting, but he later suffered a fatal heart attack at his home. Dr. Rehder was the current chair of the PAS: APAL Book Awards Committee, and he was a past recipient of the Fred B. Kniffen Book Award for his 2004 book, Appalachian Folkways. 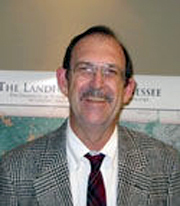 Dr. John B. Rehder, PhD, age 68, of Knoxville passed away suddenly Tuesday afternoon, April 19, 2011. Dr. Rehder was a loving and devoted husband, father and grandfather. He was a faithful member of West Hills Baptist Church where he was passionate about singing in the choir. Dr. Rehder earned his Masters and PhD from LSU in Geography in 1969. Dr. Rehder served in the Geography Department at UT for 43 years. He was on the Board of Directors of UT Press and also authored 2 award-winning books, Delta Sugar and Appalachian Folkways. His third book is currently being reviewed for publication. Dr. Rehder was an avid outdoorsman who enjoyed fishing, camping, boating, skiing, hiking to LeConte. In February, 2011 he proudly attended the award dinner where his daughter, Karen Rehder was recognized as the Knox County Middle School Teacher of the Year. “Opa” especially treasured time on the golf course with his son, Ken and grandson, Allen and also showering his granddaughter, Emma Caroline with stuffed animals. Dr. Rehder was preceded in death by his parents, Burk Rehder and Laverne Rehder. He is survived by his wife of 48 ½ years, Judy Rehder; daughter, Karen Rehder; son and daughter-in-law, Dr. Ken and Angie Rehder; grandchildren, Allen and Emma Caroline Rehder; brother, Charles (Chuck) Rehder and wife, Jeannie of NC; niece, Katie Rehder of CA; sister-in-law and brother-in-law, Gayle and Stu Roth of North Carolina; nephews, Chris and Kevin Roth and families of Texas; best friend and hiking buddy, Rodney Franks; many friends and church family. The family will receive friends 5 to 6:45 pm Friday with a Memorial Service to follow at 7 pm at West Hills Baptist Church, 409 North Winston Road with Rev. John Pennington officiating. In lieu of flowers, memorials may be made to West Hills Baptist Church Choir. The funeral home Farragut Chapel, 11915 Kingston Pike is serving the Rehder family. This entry was posted in John B Rehder, Obituaries. Bookmark the permalink.